I am currently working on a child sexual abuse prevention program in Kasur and Sheikhupura titled "Safer Society for Children." The project is funded through a Rs. 30 million grant, awarded by the U.S. Embassy in Pakistan. I am also conducting research on issues surrounding terrorism trials and national security, the refugee crisis in Pakistan, and the economic feasibility and social acceptability of the Belt and Road Initiative (BRI). Before joining ITU, Syeda Amna Hassan was a freelance reporter and private investigator, conducting investigations for terrorism and corruption trials. She was primarily retained by international law firms defending Pakistani clients accused of criminal activity based on thin or inconclusive evidence, and helped them gather evidence in Pakistan. She also wrote sporadically for local and international publications, including National Geographic, Pulitzer Center, Express Tribune, and Daily Times. 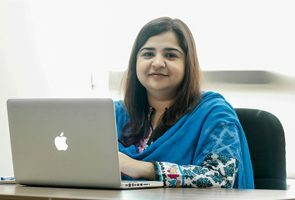 She has a Master’s degree in Journalism from UC Berkeley, and a Bachelor’s degree in Economics and Social Sciences from the Lahore University of Management Sciences. She is a Fulbright Scholar.